Recently MSE experienced terrible flood of outright off-topic debugging questions. I would like to learn more about users asking these questions. Specifically, I would want to find out how many of these askers were banned or warned or somehow else asking limited at Stack Overflow. I expect these stats to help understand if maybe current MSE guidance (including flashing system banner) is insufficient to help new users understand site topics or maybe some (most?) of of them are simply desperate and determined to ask their question wherever possible no matter what. You see, askers of these questions seem to ignore the prominent banner that refers them to more appropriate site - "Have a programming question? Head back to Stack Overflow" - as if they desperately want to try their luck no matter what. They don't delete questions even when these are closed and heavily downvoted - as if they desperately hope to have them answered at least in comments while question is still visible. Or maybe above is wrong impression and these askers are regular legitimate users who just did not realise that this site is not Stack Overflow. Without stats it's only a blind guess. The Terms of Service inbox notification hit the inbox on April 19th, so I ran some numbers since that date to hopefully answer your questions. While the site was inundated with off-topic questions, only 9% of the users asking had hit a block on Stack Overflow at some point in the last 30 days. I don't think the problem was because of users hitting a block, I'd guess it mostly came from users not realizing they went to a different site when they read the updated Terms of Service. It's definitely something we need to think about in the future when we send inbox notifications to the entire network of users. Not the answer you're looking for? 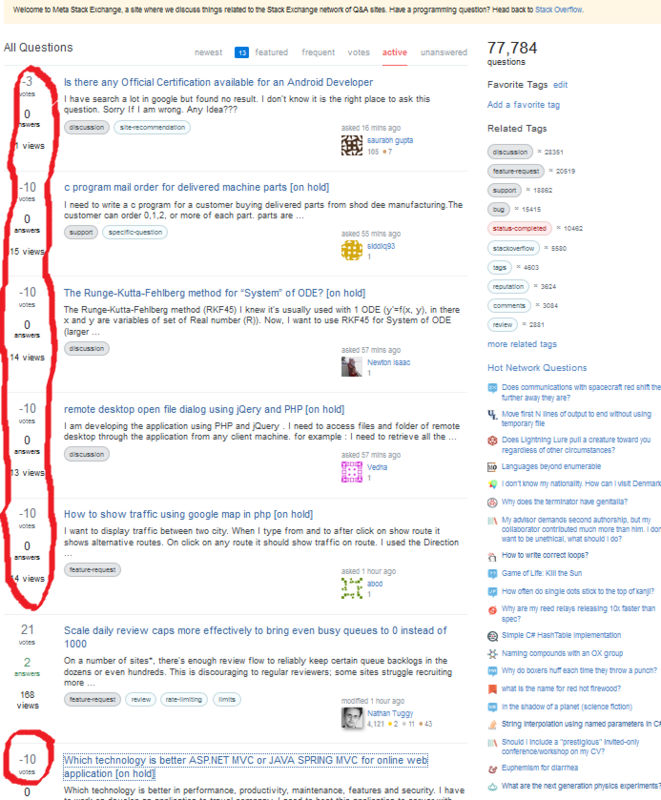 Browse other questions tagged support stack-overflow meta off-topic statistics . What is the cause of the recent increase in blatantly off-topic posts on Meta? Why can't I start answering questions? Where do first visitors on Meta Stack Overflow come from? Why do some off-topic questions get closed, while similar questions remain open?